Trend Watch: Is Gray Here To Stay? It should come as no surprise that gray has officially caught fire as a trendy color to include in your home interiors. All you need to do it take a look at your Pinterest feed or even the covers of the magazines at the grocery checkout. Gray has found its place in the home and the kitchen. We recently had the opportunity to attend a Design Symposium hosted by our friends over at Dura Supreme Cabinetry. We spent the good deal of the day learning about current trends as well as trends forecasted to hit the industry soon. We can’t wait to share with you what we learned from industry leaders and we thought addressing this common question is a great place to start. Weekly, (sometimes even daily) our designers get asked by our clients “Gray?! Isn’t that a trendy color to use on such a permanent project?” The short answer is yes… but allow us to present the strong case for why you should still consider it. What used to be a fun accent color has now taken over the entire palette of color choices. When companies like Formica, Dura Supreme, and Cambria invest a large amount of money into research and development of new materials and selections for our customers it is your first clue that this “trend” is not dissolving anytime soon! So how much longer will gray remain “a thing”? About 5-8 more years. So if you have been holding off on gray, you still have time! Just like any color you shop for in an outfit or while furnishing a room in your home, do what you are comfortable with. 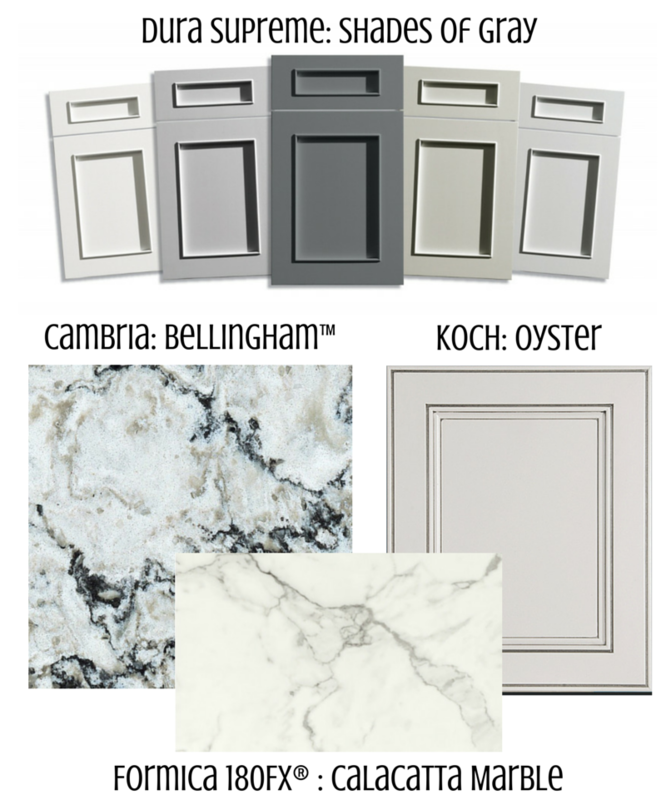 If a gray kitchen from floor-to-ceiling is not your thing there are so many options on how to include gray into your space no matter what your comfort level. What is the “Classic” approach to including gray in your kitchen? 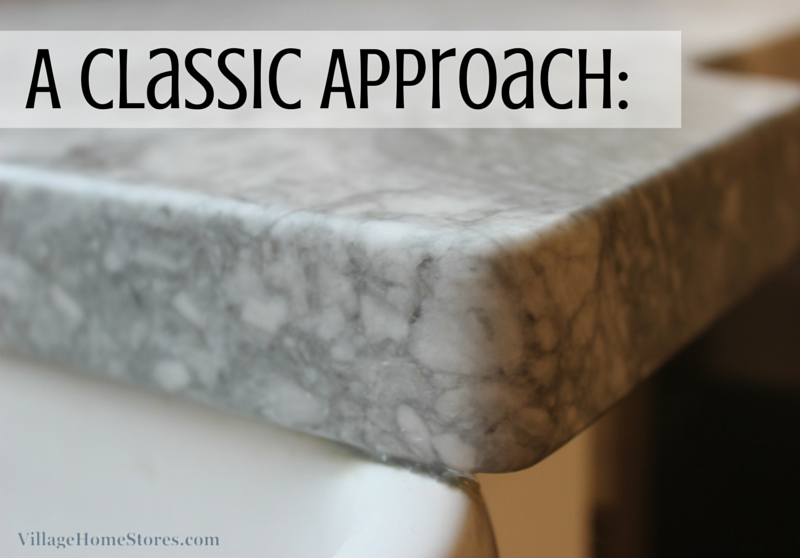 Consider one of the very first materials used in ornament and decoration… marble! 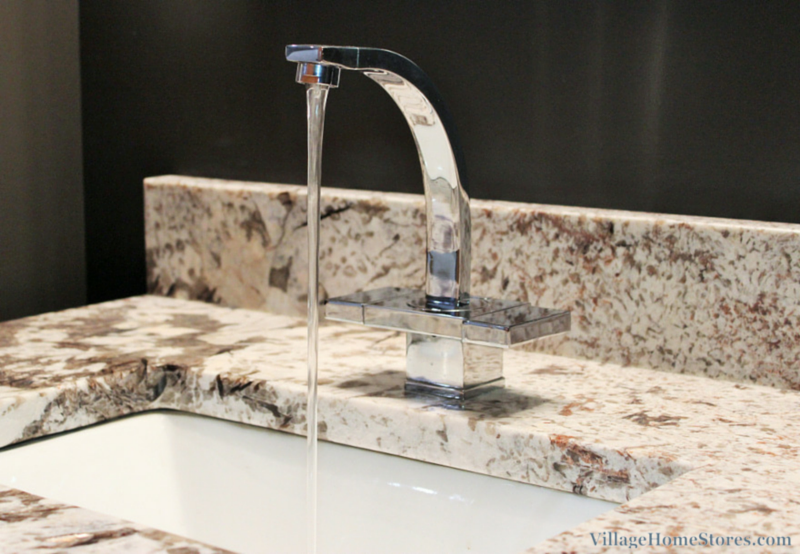 You can’t get a more classic look than gray veining in a slab of natural marble. 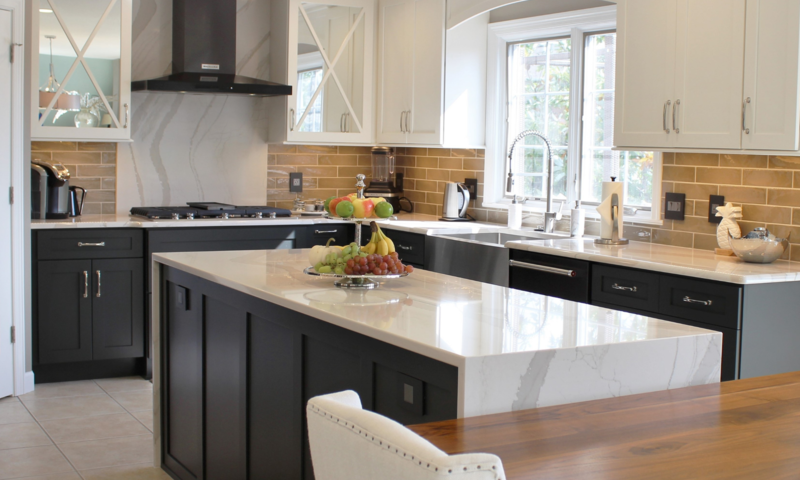 This continues to be a popular choice for kitchen countertops and Formica has even taken steps to improve options if you budget doesn’t allow for true marble to be installed. Take a look at the “Calacatta Marble” and “Bianca Luna” designs available from the Formica 180fx® series. 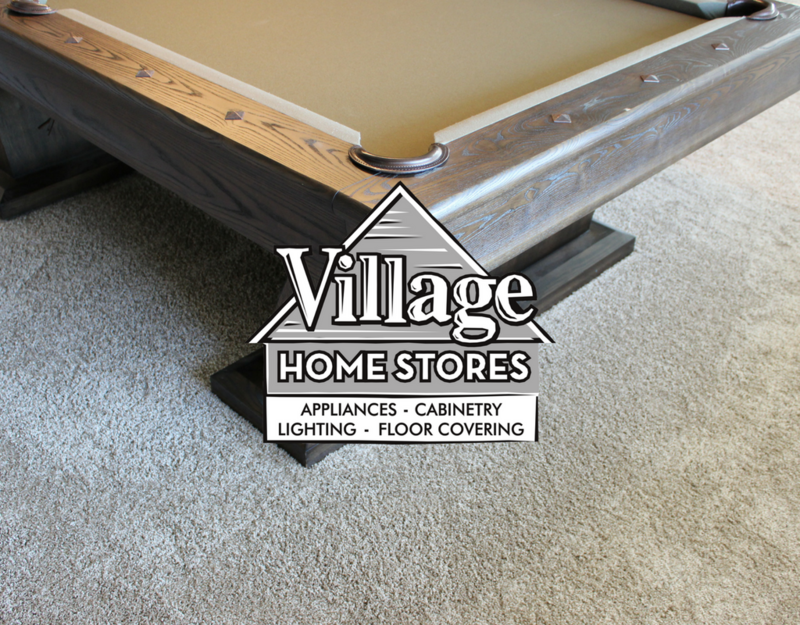 Larger patterns and a more realistic texture get you as close as possible for a fraction of the price. Take a look at this Rock Island kitchen we remodeled that includes a more classical look. 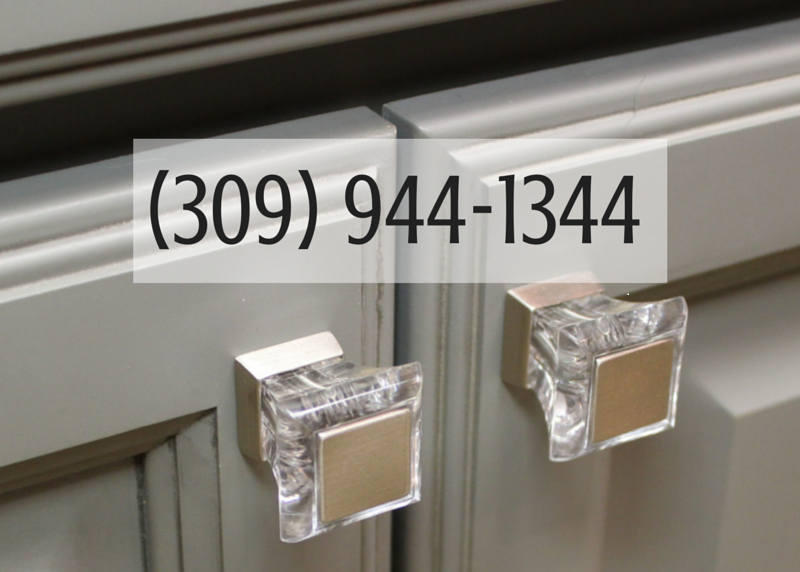 The Koch “Oyster” paint is a subtle gray color in place of a painted white. 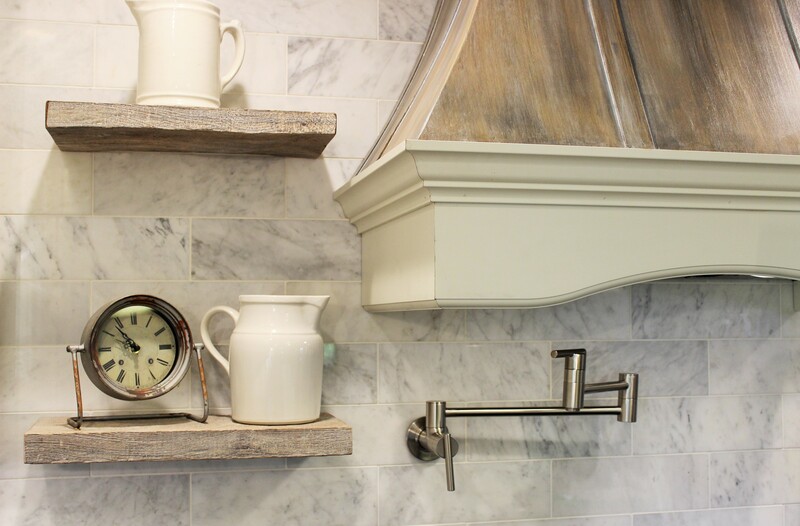 The marble tile in the backsplash is another classic choice. Even though gray is predicted to continue to popular for at least the next 5-8 years, you may want to take a more cautious approach to including it. If that is where your comfort-level is with the trend you still have a lot of options. Think of the non-permanent surfaces of your space that you may want to revisit in the next 5-8 years. Paint is a great example. 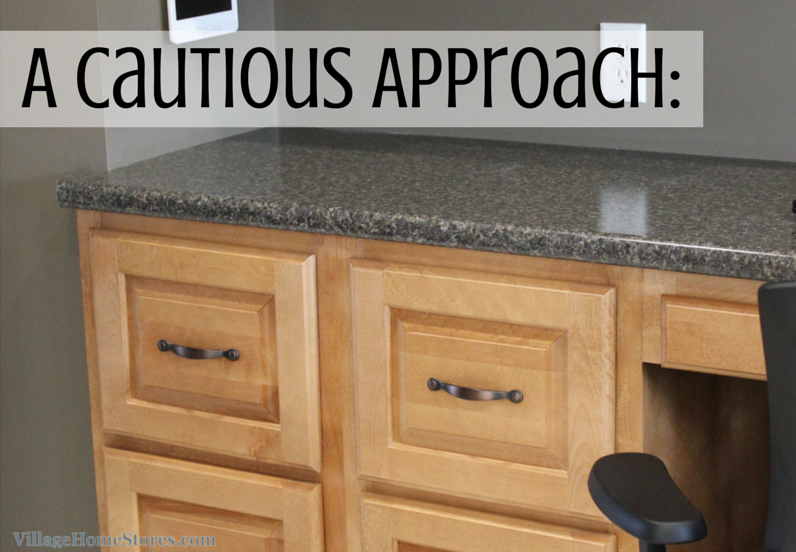 Keeping the more permanent materials like cabinets, flooring, and countertops neutral leaves the door open to change out the wall color a few years later and get an entirely refreshed look. Other places can be in your kitchen accessories like barstools and linens. 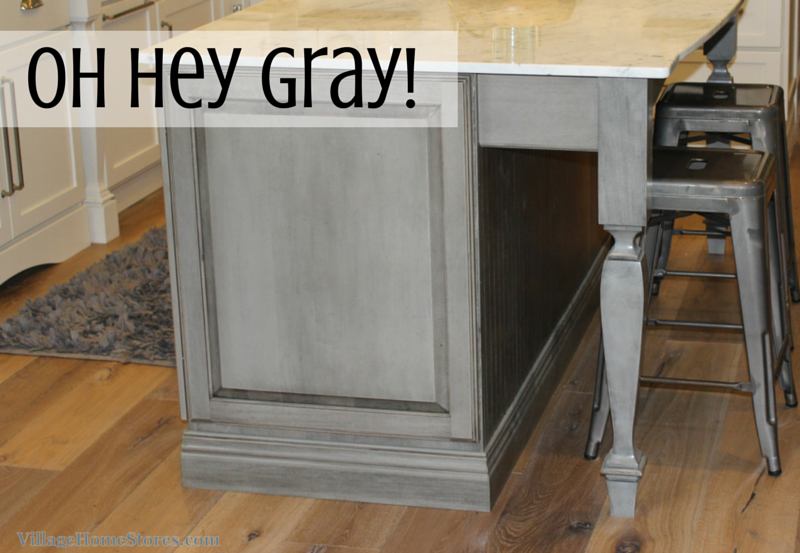 Gray kitchen islands have been so popular in the Quad Cities and surrounding areas. We have installed many in remodeled spaces like this Moline kitchen but dozens and dozens into new homes as well. 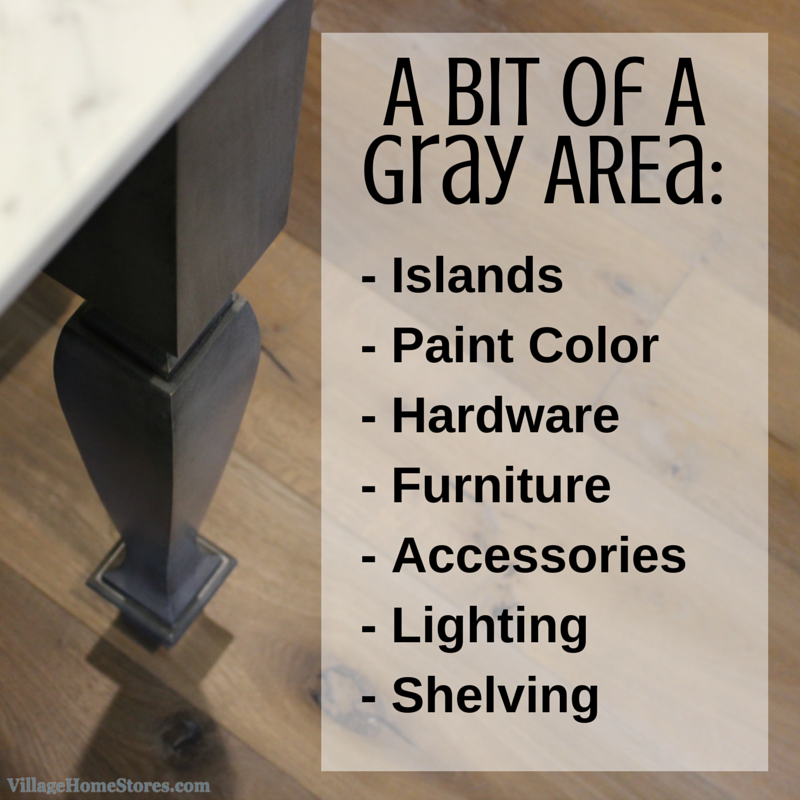 Another great idea for a way to accent your kitchen with gray is to include gray floating shelves or even finish the back of an open cabinet with a gray panel. The barnwood shelves in this remodeled kitchen from Village Home Stores also displays another great accent item, teh hood. Take a look at our “Gray Is Here To Stay” Pinterest board to see tons of great examples of gray accents in action. Gray has always been an option for kitchen materials but the past few years and predicted years to come, it is a force to be reckoned with! We just installed this new gray weathered Cherry island in the showroom (shown above) from Dura Supreme and it was quite the conversation-starter at our Q.C.B.R. booth this year ( and don’t worry there is a full tour of this new display hitting the blog soon). 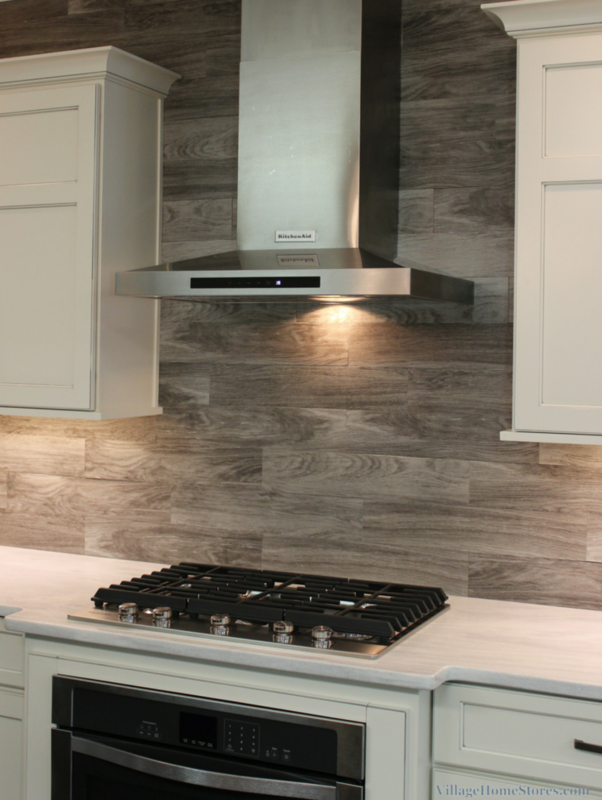 Something that really stuck with us when we attended the Design Symposium was a statement from Karen Wistrom ASID, Vice President of Marketing at Dura Supreme Cabinetry who said gray is “not just for prison walls and cloudy days” anymore. We agree and can’t wait to help you get started on your own project. Contact us today with a click or a call and let’s get started! Next PostNext Feature Kitchen: Weather or Not?